Storing the essential tools in a compact space has always been a problem for the people. Either one has to carry a bulky box or have to decide on keeping some equipment back at home due to inadequate space. But with the invention of the portable tool boxes, this problem has been a matter of least concern. Beautifully sectioned and divided into the compartments, each box has sufficient space for fitting in your essentials. Plus, it features a latch or lock system so that nothing goes out of sight during the time of need. Well, choices are many but one can trust only the best. After studying and testing the highly-demanded toolbox, here are the ultimate portable rolling toolboxes that made its way to our list. Tool cart with plastic drawers, tool box and tool chest. 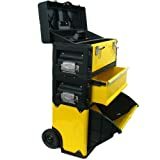 Whether you are a professional or a homeowner, you would absolutely love this portable tool box with wheels from Stalwart. 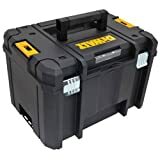 Whether you want to start on a fresh new project at home or while you are on the road, this toolbox will hold everything to bring out your excellent craftsmanship. It has strong glider wheels which can easily support the weight of your toolbox while making movement and manoeuvres easier. 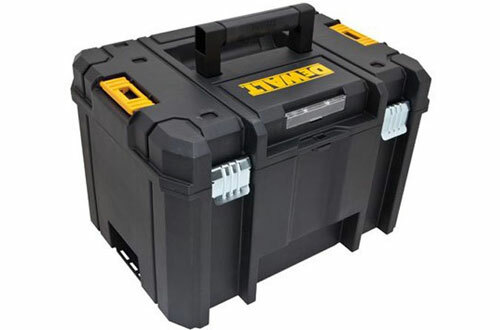 Further, it is made of high-quality steel along with injected moulded polymer and has 3 box compartments that give you enough space for all your tools. The boxes are even versatile in nature since they can be detached individually so that you have an easier time transporting the whole thing. Comes with a carrying handle at the back. You have access to all the chambers without the need of breaking the whole thing down. Adequately stable even when you keep the drawers open. 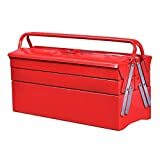 Tool Bags are good but don’t look professional enough or provide you with the easy access that a portable metal toolbox organizer has. 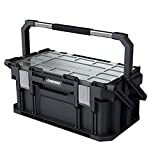 The Goplus cantilever toolbox looks great and the whole thing is constructed of high-quality steel. It has a very nice appearance and the red powder coat gives it an excellent finish. You get 5 large trays that open up in 3 levels. This way it is much easier for you to organise your tools in various trays and you don’t need to dig your way through one large space. With a total carrying capacity of 66 pounds, you get a lot of freedom to carry an array of tools with you. Even the handle is made of heavy duty and solid steel so that you can carry it easily. Weighs just over 10 pounds. The upper tray can hold up to 11 pounds while the bottom tray can hold up to 22 pounds. Powder coat protects it from corrosion for prolonged use. Keter Masterloader Pro toolbox is an ingenious innovation that breathes fresh air into a market filled with generic designs. For your tool storage, you don’t need to look anywhere else. You would be able to get everything you need for all the projects you do at a single place. Plus, one gets three levels of the organization and convenient storage for all of your job site tools and supplies. At the bottom, you get giant storage which is ideal for power tools, extension cords and much more. At one of the upper-level organizers, you get six removable bins that keep all of your fasteners and accessories within easy reach. The other one holds your hand tools and has a divider for a neat and hassle-free arrangement. Furthermore, instead of levers or hinges, you get a smooth ball bearing system that is made of durable metal and allows smooth operation. It even has durable wheels and a sliding trolley styled handle that makes transportation of bully tools an effortless job. 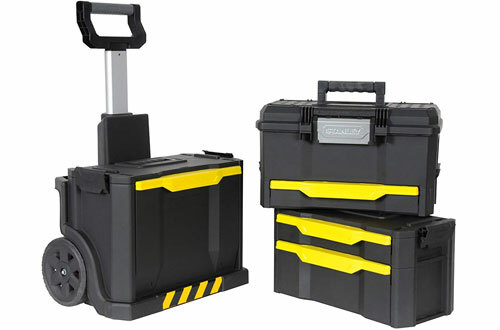 Finally, the portable rolling tool box with lock even has bins placed on the lid. Simple turn switch to open the toolbox. Everything can be protected with a convenient lock on the turn switch. Metal handle that allows you to carry everything with a soft grip. Stanley Tools always makes the best products for workshops and tool storage. This amazing tool cart is another marvellous product that makes your life easier by several folds. It has a modular design and a modern look. The overall sleek black colour with yellow accents adds to its personality factor and makes you stand-out. You can customise the rolling workshop according to your needs since it has stackable toolboxes that can be easily detached. So depending on your workload you can simply stack or remove toolboxes. Plus, no need to carry the whole workshop even when you have a light workload. You will get 78 cm wheels that are made of the heavy-duty materials and can easily carry a heavy load to provide maximum manoeuvrability. You won’t be limited to power tools and hand tools only. And one can even carry long tools like a saw. Drawers get smooth and high strength ball bearing sliding system. Locking mechanisms are reliable and easy to use. The handle is made of aluminium and has a telescopic design. Homak makes its product with the best available raw materials that add to their strength and longevity unrivalled in the market. 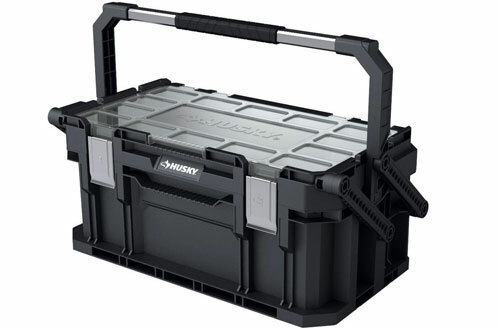 At the top of the toolbox, you get a polycarbonate handle that gives you a superior grip without being uncomfortable. You don’t need to worry about the safety of your tools since it comes with a flap that can be equipped with a padlock. 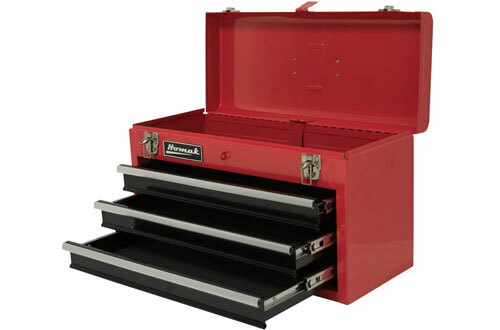 The 20-inch professional portable toolbox with drawers is made of steel and has three sliding drawers. 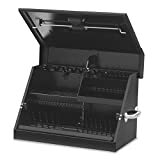 The drawers are equipped with enough mats and ball bearing to keep your tools and accessories family in a place with a smooth sliding action. And also, it is equipped with slip-resistant mats. Double metal latches close the box. Red colour and shiny finish give it a premium look. A warranty period of one year. The feature that you will like most about this triangle toolbox from Montezuma is its weather resisting capabilities and resistance to natural elements. It has a unique design which keeps all of your tools firmly in their place no matter how shaky the road is. Further, it even comes with an inbuilt you look so you don’t need to sceptical about any safety issues. Constructed of premium quality steel along with welded seams, it is fully weatherproof. So, no harm will be caused to your tools even in the roughest weather. Made of high-quality 16-Ga. Steel. Socket tray and the lid are lifted by a gas spring to reveal even more storage. Dewalt always makes excellent tools to assist in your work and has been a reliable brand for decades. Now you can buy the brand’s incredible storage solutions with higher quality, unlike cheaply manufactured alternatives. 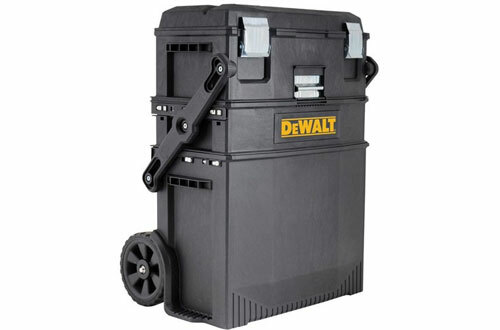 It has an adequately large bottom bin that is very deep and perfect for storing your big hand tools and power tools. Also, the box can fit your circular saw, jigsaw, sander and a lot more. Just above the bottom bin, you get a large organisation section. This is divided into compartments to store all the bits and pieces of screwdriver heads, nuts, bolts and other miscellaneous things. The cantilever and heavy-duty ball bearing sliders makes accessing the larger compartment and bin super easy for you. Latches are made of metal and can be opened or closed with one hand. Sturdy wheels make moving your portable workstation a breeze. Telescopic handle has a comfortable grip. 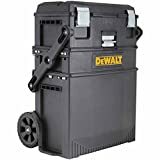 Dewalt TSTAK organisers come in totally modular design storage units. With each unit sold, separately they offer a customised solution inconvenience and transportability. Regardless of the trade, you work in this system, it allows you to build a personalized storage unit around your job’s need. 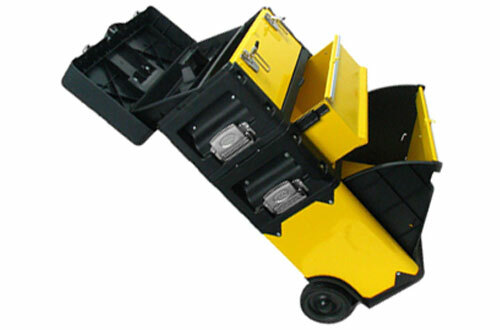 The unit is made of durable polypropylene to withstand a lot of abuse and regular job site rough handling. 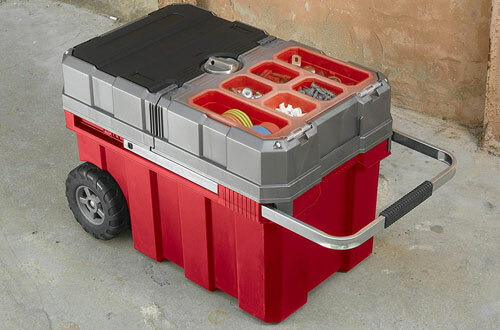 With the huge storage capacity of 23 litres, you get ample room for your power tools and other heavy accessories. It even comes with a removable tool tray with smaller and delicate handles. You can also fit in customised foam padding to store your hand tools and power tools in place. Along with bi-material handle, it also has an interlocking capability. Has a carrying capacity of 44 pounds. Compatible with other TSTAK units. Overall, a really well made and nice product that will always exceed your expectations. On the top compartment which hinges out, you get 12 trays lined with the boundary for all your fasteners, screws and other accessories. Next, you get a roomy big space is left in the middle for all your big tools so that you can reach everything you need within seconds. Underneath the hinged compartment, you get a large bottom bin to keep your wires, power tools and other stuff you might need. Further, the cover, as well as the tray, is light and the quality hinge system makes it convenient. Plus, there is an inbuilt locking system on the hinge. Affordable with a high huck to bang ratio. The handle is strong with rubber grip for added comfort. 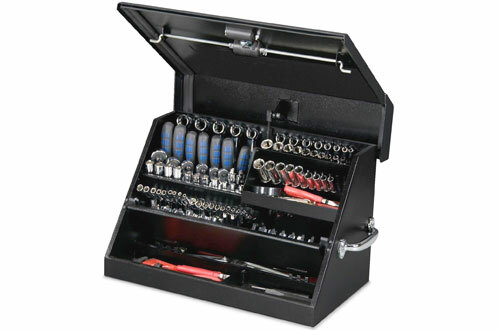 Modular toolboxes are all the rage right now with a craftsman of various trades. The biggest benefit of that is you get to make a custom solution and have to carry around only what you need. 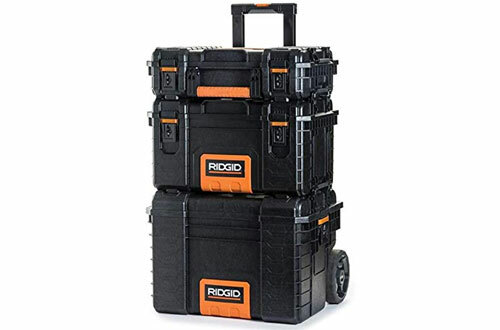 This innovative system from RIDGID has three storage units that are stackable. 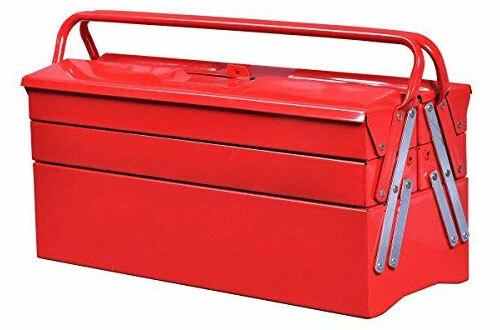 On the side of each of the toolbox, you get metal locking connectors that connect to the box above it. You can also use these connectors as side carrying handles for easy transportation. All of the boxes are made of metal that gives them a rigid and sturdy structure while the nice rubber grip is for comfort. Moreover, the boxes have a slot on the front and the sides. You can have a bar through them or a padlock so that they can’t be unlocked even if you unstack the whole thing. Inside is lined with a seal to keep dust and moisture out. Hinged lids have a lip on the front for easy opening the box. Each has a nice beefy plastic handle wrapped with a rubber grip. From farming to fixing your trucks, the portable tool storage unit will easily keep all your tools safe and always at hands reach.